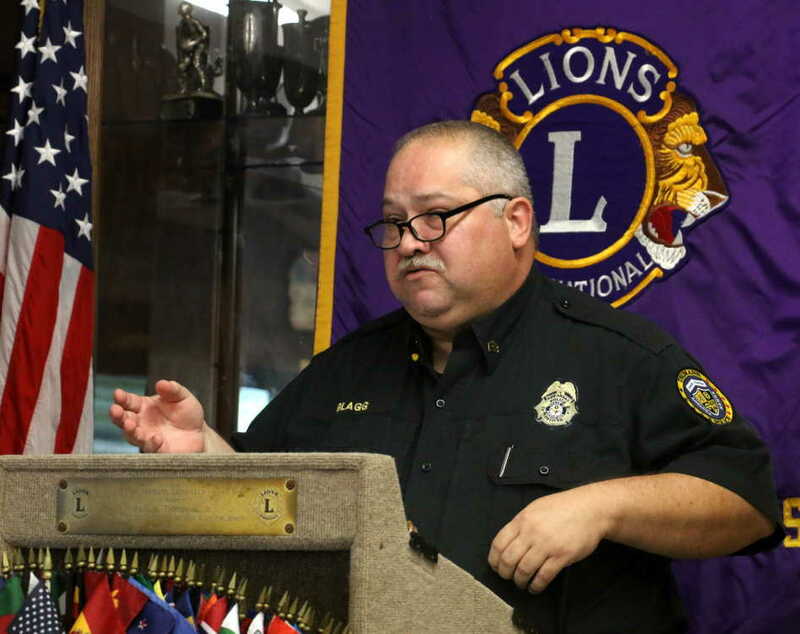 Sergeant Shane Blagg, with Trumann Civil Enforcement Division, was the the guest speaker last Wednesday at the Trumann Lions Club. Born and raised in Trumann, Blagg has been married for 29 years to his wife Katrina, and they have a 23 year old son named Devin. "I was born at Smith Clinic here in town, and I so enjoy working with the citizens of Trumann," Blagg said. Blagg, who has been with the police department for 25 years, is one of three officers on this division of the police department. Captain Gary Henry leads the division, and Animal Control Officer Ronnie Henley takes care of the stray animals and the the shelter. Henley also transports prisoners when needed. Blagg also told the court that all three can serve in another capacity. "We are all three certified, which means we can also assist in normal police situations. I think it's a plus to the department to have three extra officers to help in the need arises," Blagg said. Quality of life issues are what Blagg told the club the division handles. "We enforce the ordinances and codes within the city limits of Trumann. We get the information needed for the citizens on the codes, and we follow up on any violations we have noticed," Blagg said. Blagg told the group that new residents to the city and those that have moved from outside city limits are sometimes not aware of the ordinances and codes. "After living outside the city limits, a lot of people think they can do the same things inside the city limits, and we have to let them know what they can and can't do," Blagg said. Some of the biggest issues Blagg said they deal with are overgrown lots, non-operable vehicles sitting in yards and just general upkeep of properties. "We try to be nice to everyone we have to contact and just want them to know that keeping things cleaned up is vital to the city for prospective new businesses and residents," Blagg said. Blagg also told the group that a lot of the property owners live out of town and are hard to contact sometimes. "We also do inspections, like for new residents or businesses to make sure they are up to code on everything," he said. Blagg said they have to make sure electrical and plumbing are up to code and make sure their permits are in proper order. "We also inspect properties that are in possible need of condemnation. We want to try and work with everyone, but sometimes we have take a person in front of a judge due to them not meeting the requirements they are supposed to. We want to make the community nice and safe for everyone who lives here," Blagg said.